An 80-year-old woman was admitted for a 2months history of non-healing ulcers on both feet. She is known to have type 2 diabetes, dyslipidaemia and hypertension for 30 years. She has a history of a femoral fracture on the left incurred after a fall 2 years ago for which she underwent open reduction and internal fixation. On physical examination, there were ulcers on the lateral aspect of both feet and on the right malleolar area. Dorsalis pedis pulses were absent bilaterally. An X-ray of both femurs was requested to check if the fracture healed properly and to rule out a new fracture since the patient remained bedridden despite surgery to correct the fracture. 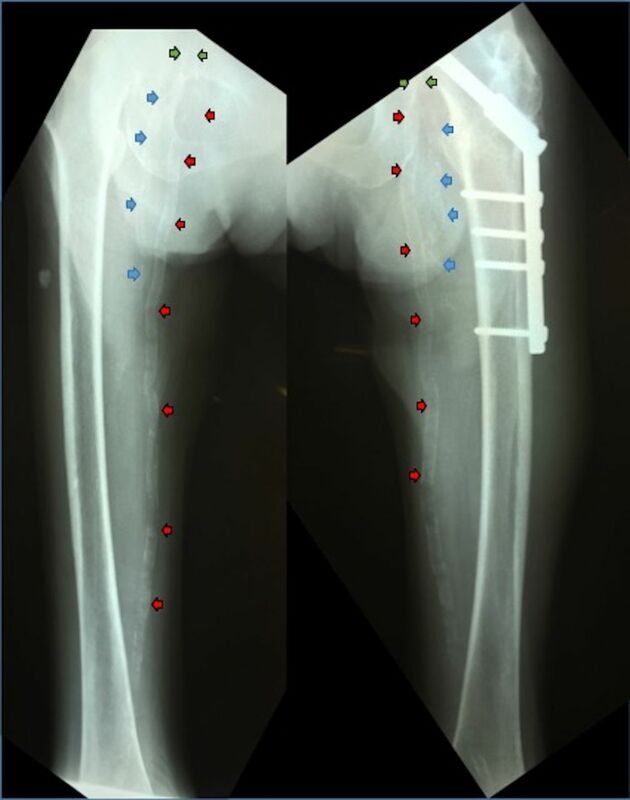 The X-ray revealed a metal implant on the left femur and with no new fracture. Incidentally, the femoral arteries were noted to be calcified along their entire length indicative of atherosclerosis (figure 1). Lower extremity X-ray: calcified common femoral arteries (green arrows), deep femoral arteries (blue arrows) and superficial femoral arteries (red arrows). 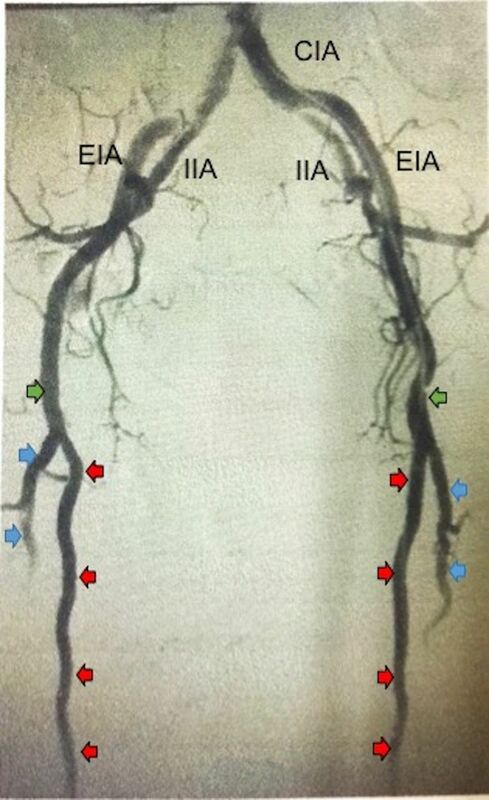 Aortography with bilateral lower extremity run-off was done to demonstrate patency of the arteries. This showed heavily calcified but patent common femoral, profunda femoris, superficial femoral and popliteal arteries bilaterally (figure 2). Other pertinent findings were severely diseased and occluded anterior and posterior tibial arteries bilaterally. Both peroneal arteries were diseased but patent down to the distal leg. The patient was managed medically with statin, aspirin, diabetes and antihypertensive medications. Local wound care was also provided. Although catheter angiography is considered the reference standard in the diagnosis of PAD, an easily available and non-invasive modality such as Doppler ultrasound that does not require the use of potentially nephrotoxic contrast agents can also be used.1 Calcification of peripheral vessels may cause a decrease in elastic recoil of the involved vessel, leading to diminished Doppler signals (ie, from a triphasic flow to a biphasic or monophasic flow pattern).3 4 Plain radiography on the other hand is a valuable but semiquantitative tool in the detection of vascular calcification. Atherosclerosis can symmetrically affect the arteries of the lower extremities. On this X-ray, we have seen both femoral arteries to be heavily calcified along their entire length. Even if the femoral arteries are heavily calcified on X-ray, they can still be found to be patent on arteriography.
. Doppler ultrasonography in lower extremity peripheral arterial disease. Arch Turk Soc Cardiol 2013;41:248–55. Contributors ALFJ wrote the initial manuscript. MASS and LK contributed to the writing of the final version of the manuscript. LK performed the arteriogram. All were involved in the care of this patient.